Our facilities include parking areas, boat launch and day docks, restrooms and picnic areas – all of which need to be maintained on a regular basis. Payment of your use fee helps us provide this service. Occasional or one-time users may prefer to pay a DAY USE fee of $10. Find a ticket machine onsite. The ticket machine will accept both debit and all credit cards, including American Express. It is, however, unable to process a ticket purchase with cash. Annual use passes are not available with the machine. Frequent port-facility users may prefer to purchase an annual use permit. The fee is $55 for those with an address outside the 98642 zip code. For those inside the 98642 zip code, the fee is reduced to $45. Who Should Pay the Use Fee? 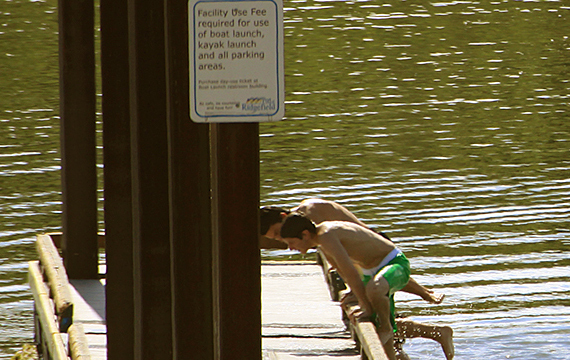 If you park your car in the boat launch parking lot for any reason, or launch your kayak, boat or other vessel from port’s boat launch, you are required to pay the use fee. Hours: 8 a.m. to 5 p.m., excluding holidays. Mail – Download this form, fill it out and return to the port with your appropriate payment.